I am carrying on from last months inspiration post which you can read here. I found creating these inspiration boards very helpful for deciding where I want to take my wardrobe and this blog. This month I have identified four trends I have seen from the street style of Paris fashion week and some from just shopping around on the high street. So let's get into April's inspiration post! 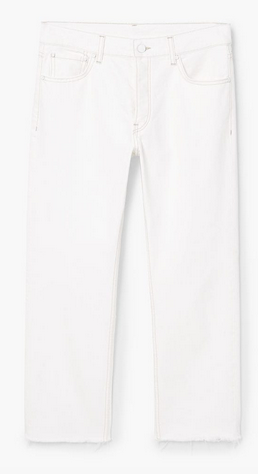 The next piece I am loving at the moment is cream or off--white denim jeans. This came about when shopping in Mango and I tried on a pair with a white t-shirt and instantly loved the look and wanted a pair. I have linked below the Mango jeans plus a few other styles from the high street. This trend I feel could be a one off maybe just for me, but I have fallen back in love with metal statement earrings. I love the manipulation of the metal to create a fun and unique piece. If I am daring enough I could only wear one or mix and match a few of the ones I am picked out below! This first inspiration photo gets a massive thumbs from me! This look, on the left, was photographed at Paris Fashion Week. I actually don't know who the lady is but I love this longline denim jacket and how she has styled this piece. I like the fact that this longline jacket could have been made in a tencel or into a trench coat fabric, but instead the denim gives it a fresh look for spring. Below I have sourced four high street pieces that fit within this trend. The third key trend I am loving for spring and for festivals is retro yellow shades. The lady on the left nails this look and the shades stands out across her tonal blue outfit - great for spring. This is the kind of trend you can experiment with and purchase different shapes of lens. Below are a few of my favourite styles on the high street. So guys, that's my April inspiration, I am feeling very inspired by the shops and what they have to offer. As always let me know what you think in the comments below of any of these trends and if you like them or alternatively let me know about any trends you are loving this month!